Mysia, Parion. Silver hemidrachm. ca. 480 BC. Size : 12.2 x 13.7 mm. Weight : 3.29 grams. Obverse : Gorgon head facing, with a protruding toung. Reverse : Incuse square with a dot in the centre, and divided into a geometric pattern. There are flow lines consistent with die deteroriation, and some dirt still encrusting the reverse an in the low points of the obverse. 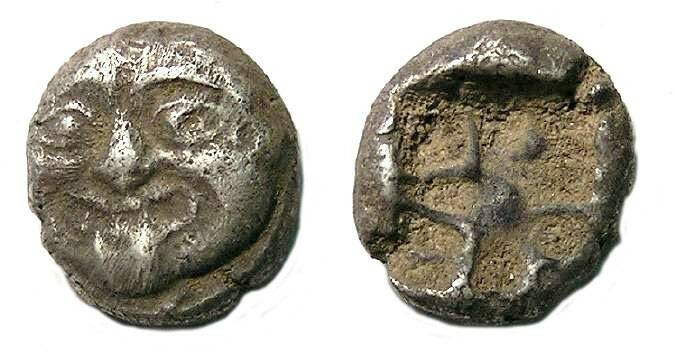 This is a series often struck with dies so worn and deteriorated that the gorgons face is almost indistinguishable, and so this is a reasonable nice example of the type.